IT WAS GIVEN IN 1965 TO A C. BOURNE FOR HIS WORK IN THE AMBULANCE BRANCH OF THIS ORGANIZATION. A LOT ON THIS ONE. GOOGLE RESEARCH,. BEAUTY AND EXTRA RARE. 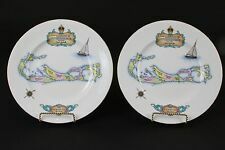 Charming pair of collector plates depicting a map of the Bermuda Islands. Each plates depicts the various parishes of Bermuda. A the top of the plate, under a royal crown, is a brief discovery and colonization history, the bottom contains a Bermuda Island plaque decorated by fanciful sea creatures. They are made by blacksmiths in a French repouse' style from circa 1129 A.D. patterns. The wrought iron is chased, raised and not flat. KEY IS MISSING. EXCELLENT CONDITION DUE TO ITS AGE.6" X4" X4.5". WEIGHTING 3 LBS. 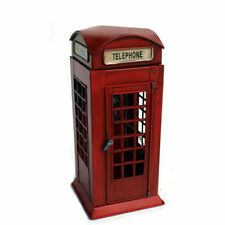 ESTATE COLLECTION ITEM FROM LONDON, UK. MODRED THE WISE. Although he. sacrifice, added her entreaty to the pleading of Modred, and the Roman captive was safe. was an enemy, the Druid took him to his cave, and cared for him. ORIGINAL 1930s TRADE - ADVERTISING CARD. The Gold Coast was a British colony on the Gulf of Guinea in west Africa from. 1867 to its independence as the nation of Ghana in 1957. deposits of gold in the soil. The kingdoms had a tradition of enslaving captives. Great collectible plush from Thistle Products. This plush sits up well and is very soft and very clean, like new. Angus, Scotland. THE DUMB TWIN BROTHERS. dreadful curse. A serf on Lord Crawford's estate had twin sons, both dumb, and marred with spots on face and. ORIGINAL 1930s TRADE - ADVERTISING CARD. Ugly as they were, lord Crawford held them in high favour, for they were great hunters. HISTORY OF THE BRITISH EMPIRE. ORIGINAL 1930s TRADE - ADVERTISING CARD. THE IMAGES ABOVE ARE LARGER THAN THE CARD. THIS CARD IS NOT A MODERN REPRODUCTION - IT IS AN ORIGINAL. PAPER LOSS - SMUDGING - BENT and/or ROUNDED CORNERS. THE LAMBTON WORM. to a hiding place more suited to its ever-increasing size. The heir of Lambton went. ORIGINAL 1930s TRADE - ADVERTISING CARD. THE IMAGES ABOVE ARE LARGER THAN THE CARD. THIS CARD IS NOT A MODERN REPRODUCTION - IT IS AN ORIGINAL. THERE IS ADVERTISING TEXT ON THE BACK! ORIGINAL 1930s TRADE - ADVERTISING CARD. HISTORY OF THE BRITISH EMPIRE. sequence of powers including the Phoenicians, Romans, Fatimids, Sicilians, Knights of St John, French and British have all. THERE IS ADVERTISING TEXT ON THE BACK! ORIGINAL 1930s TRADE - ADVERTISING CARD. HISTORY OF THE BRITISH EMPIRE. PAPER LOSS - SMUDGING - BENT and/or ROUNDED CORNERS. THE IMAGES ABOVE ARE LARGER THAN THE CARD. DELHI INDIA. HISTORY OF THE BRITISH EMPIRE. THERE IS ADVERTISING TEXT ON THE BACK! ORIGINAL 1930s TRADE - ADVERTISING CARD. THE IMAGES ABOVE ARE LARGER THAN THE CARD. THIS CARD IS NOT A MODERN REPRODUCTION - IT IS AN ORIGINAL. THERE IS ADVERTISING TEXT ON THE BACK! ORIGINAL 1930s TRADE - ADVERTISING CARD. HISTORY OF THE BRITISH EMPIRE. THE IMAGES ABOVE ARE LARGER THAN THE CARD. THIS CARD IS NOT A MODERN REPRODUCTION - IT IS AN ORIGINAL. The Federated Malay States was a federation of four protected states in the Malay Peninsula-Selangor. BRITISH COLONIAL FLAG OF THE FEDERATED MALAY STATES. THIS IS AN ORIGINAL 80 YEAR OLD TRADE - ADVERTISING CARD. British naval victories, particularly during the Napoleonic Wars. Vice Admiral Horatio Nelson, 1st Viscount Nelson, 1st Duke of Bronte, was a British. ADMIRAL NELSON. THERE IS ADVERTISING TEXT ON THE BACK! (HILAIRE BELLOC. Joseph Hilaire Pierre Rene Belloc 27 July 1870 - 16 July 1953) was an. Anglo-French writer and historian. He was one of the most prolific writers in. ORIGINAL 1930s TRADE - ADVERTISING CARD. MARJORIE BOWEN. supernatural horror stories, popular history and biography. ORIGINAL 1930s TRADE - ADVERTISING CARD. THERE IS ADVERTISING TEXT ON THE BACK! FAMOUS BRITISH AUTHORS. THE FRONT OF THE CARD HAS A FACSIMILE OF THE AUTHOR'S SIGNATURE. Zennor, Cornwall. The people of Zennor had long wondered at the beauty of a richly-dressed lady who attended. She asked the captain to raise his anchor, as it was barring. the entrance to her house. Matthew Trewella and lured him away, tongues began to wag. CROWN COLONY OF HONG KONG FLAG COLONIAL BRITAIN. THIS IS AN ORIGINAL 80 YEAR OLD TRADE - ADVERTISING CARD. THERE IS ADVERTISING TEXT ON THE BACK! IT IS 80 YEARS OLD. PAPER LOSS - SMUDGING - ROUNDED CORNERS. The Right Honourable the Lord Lyon King of Arms, the head of Lyon Court, is the most junior of the. LYON KING OF ARMS. that country, issuing new grants of arms, and serving as the judge of the Court of the Lord Lyon, the. Jane Austen was an English novelist known primarily for her six major novels, which interpret. JANE AUSTEN. THIS IS AN ORIGINAL 80 YEAR OLD TRADE ADVERTISING CARD. THIS CARD IS 80 YEARS OLD. THE REVERSE SIDE HAS TEXT ABOUT THE IMAGE ON THE FRONT SIDE. LOT/3 ENGLAND UK Great Britain Embroidered Iron On Jacket Patch 2" x 2.25"
Lot of 3 small England/Union Jack with yellow border iron on jacket or wherever embroidered patch. 2 x 2 1/4". Iron on, show your UK spirit-connection. FINGLE BRIDGE RIVER TEIGN DEVONSHIRE. Drewsteignton, within Dartmoor National Park in Devon, England. stretch of river for fishing. ORIGINAL 100 YEARS OLD TRADE - ADVERTISING CARD. THERE IS ADVERTISING TEXT ON THE BACK! KING'S BODYGUARD FOR SCOTLAND. ORIGINAL 100 YEARS OLD TRADE - ADVERTISING CARD. THERE IS ADVERTISING TEXT ON THE BACK! THE IMAGES ABOVE IS LARGER THAN THE CARD. THIS CARD IS NOT A MODERN REPRODUCTION. KING EDWARD III BATTLE OF SLUYS. ORIGINAL 1930s TRADE - ADVERTISING CARD. IT WAS PRINTED IN THE 1930s. Flanders and Zeeland. The English fleet was personally led by Edward III of England and. BRITAIN HISTORY. Queen Elizabeth I Autograph Reprint Approx Size: 3"x1". The Fifth Expedition of the Somaliland campaign in 1920 was the final. aerially bombed the Dervish capital of Taleh in February 1920. After three weeks of battle, Hassan's Dervishes were defeated. The conflict ended when the British.